Other than these three main glands, there are almost 800-1000 minor salivary glands in the oral mucosa. Like any other part of our body, with the passage of time these glands can also develop problems/diseases. 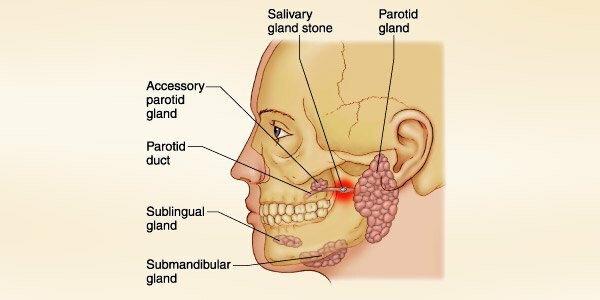 Let’s discuss some of the issues of salivary glands, their causes, symptoms and remedies. The most common SGDs include the forming of calcium stones that can completely or partially stop the flow of saliva, giving you a dry mouth. These conditions are known as Sialolithiasis and Sialadenitis (when the stones formed are due to bacteria, these are called Staph Strep). Tumors can be both benign and cancerous. Although cancerous tumors are very rare and usually occur in people who are in their late 50’s - 60’s most of the tumors are not malignant and occur both in males and females. Both stones and tumors can lead to forming cysts. Cysts are generally formed in glands where the flow of saliva has been blocked by a stone or tumor. Cysts can be very painful and create difficulty in chewing and eating. Another condition occurs when the white blood cells in your body start targeting the healthy cells in the moisture-producing glands. It is a more serious condition and is known as Sjogren’s syndrome. Some viruses can also effect the salivary glands by making them swell up and become painful. These are common in diseases like flu, mumps, etc. Some bacterial infections also create havoc for the glands. Acute bacterial infection usually occurs in debilitated or dehydrated patients. While chronic bacterial infections usually occur where there has been a gland previously destroyed by stones. Chronic bacterial infections are dangerous as they eradicate the glandular element of the salivary glands and impair the saliva of its protective functions which further leads to other diseases and gum conditions. Diagnosis can be varied according to the condition of the patient. It varies from a manual exam to an x-ray of the affected area. For more serious tumors, CT scan and MRI can also be used to provide in-depth imagery for diagnosing the disease. Sometimes a biopsy is carried out to further test the nature and degree of disease. The treatment of SGD depends on the cause and the nature of disease. For minor stones, cysts and other gland blockages, manual removal can be carried out. Other simpler methods are warm compresses and sour candies that help increase the production and flow of saliva. For more serious or malignant tumors chemotherapy or radiation is used to completely eradicate them and stop them from forming again. Benign tumors that cannot be removed through warm compresses or manual removal are removed by surgery. If the disease is related to bacteria, medication (usually antibiotics) is given to provide immediate relief from the problem. There are also medical prescriptions for dry mouth and other minor issues. To avoid facing the salivary glands disorders, it is imperative to keep the mouth cavity clean and germ free. Brushing the teeth at least twice daily is essential. Make flossing your teeth after every meal a habit. Avoid drinking and smoking. Usually most of the SGDs respond well to medication. Visit the dentist as soon as any of the symptoms appears, so it can be cured well in its early stages. Apart from all this, regular check up with the dentist is a must thing to ensure healthy and strong teeth and gums.